A need to place the fire extinguishers in the living room near the fireplace. A place where they will always be within reach. I wanted to be simple but interesting in three-dimensionaly. The size of the fire extinguishers ordered dimensions. Object as small as possibly, frame. When an object is elegant it's placed to be seen and therefore also within reach. A stylish frame, which picture can be changed easily. 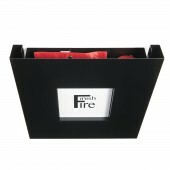 Frame is also a cabinet for your extinguishing equipment which leaves quick access to them. The fire blanket is pulled out from below. The spray extinguisher can be removed from the top of the frame or by opening the cabinet. The picture sheet insert slides vertically out. It has Finishfire logo on the front and is white on its flip side. There is nothing comparable on the market, based on our survey. When sold fire extinguishers are included in the package. The frame is mounted on the wall picture at eye level. The plastic sheet insert slides vertically out. It has Finishfire logo on the front and is white on its flip side. Here you can attach any image you like. There is also space that allows you to insert a glass plate cover. The fire blanket 120cmx180cm is pulled out from below. The handles of the fire blanket can be hidden. This product protects you from burning and it is used to suffocates flames. 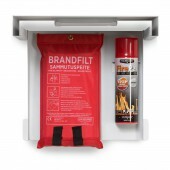 The spray extinguisher FirePal Kitchen from GPBM Nordic OY (several other spray extinguisher fit as well like Tundra from Firs Alert) can be removed from the top of the frame or by opening the cabinet. FirePal Kitchen is a compact, efficient and easy to use extinguishing spray that can be used by all (children included). It is designed for extinguishing small fires (ABF). It also extinguishes electrical fires up to 1000V. The cover is 3,5cm wider and higher than the wall mount, so the fire extinguishers can not be seen. All users must know what the cabinet contains. The cabinets are not intended for public spaces that instead follow the rules set by fire authorities. The project started in January 2016 in Espoo/Finland and finished in November 2016 in Forssa/Finland when the first industrial Frames were manufactured. Made of three sheet metal pieces: 1/wall mount, 2/frame cover and 3/additional piece of rails. Preparation does not require welding. 4/Acrylic sheet 3mm white (no opal). Frame opens the same way as the trash can lid. 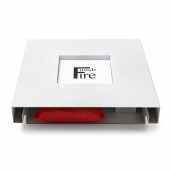 So far I have designed three products for Finishfire: Charging Platform, Frame and Umbrella stand. Frame is design number2 but it is the first one in production. The prototypes at the beginning: frame part was wooden and wall mount sheet metal. The combination of shine plastic and matt wood was interesting. Because of additional piece of rails and lower manufacturing costs, I ended up to choose sheet metal as a construction material. The production of metal was designed by Miska Saulivaara. One challenge was to create a three-dimensional for image indentation without welding. Another one was the logo. The logo is an important part of Frame. It is supposed to tell the contents of the cabinet. It is supposed to be stylish but still easy to read. Finishfire Frame Frame Covers Extinguishing Equipment by Sanna Liimatainen is a Nominee in Safety Clothing and Personal Protective Equipment Design Category. · Click here to register today inorder to be able to view the profile and other works by Sanna Liimatainen when results are announced. Finishfire Frame Frame Covers Extinguishing Equipment by Sanna Liimatainen is Winner in Safety Clothing and Personal Protective Equipment Design Category, 2016 - 2017. 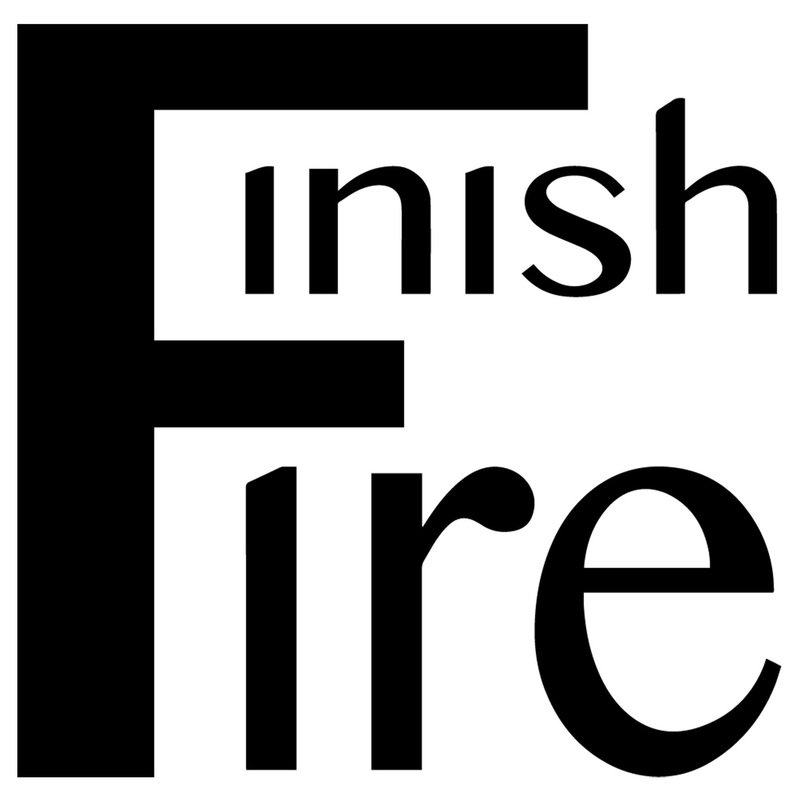 · Read the interview with designer Sanna Liimatainen for design Finishfire Frame here. · Press Members: Login or Register to request an exclusive interview with Sanna Liimatainen. · Click here to register inorder to view the profile and other works by Sanna Liimatainen. Did you like Sanna Liimatainen's Protective Equipment Design? 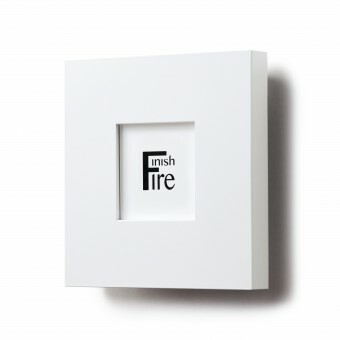 Did you like Finishfire Frame Frame Covers Extinguishing Equipment? Help us create a global awareness for good protective equipment design worldwide. Show your support for Sanna Liimatainen, the creator of great protective equipment design by gifting them a nomination ticket so that we could promote more of their great protective equipment designs.